Awesome toys to go with your McDonald's Happy Meal this month. Compliment your movie experience with these Rise of the Guardians toys! While stocks last. Interested with how the toys look like? 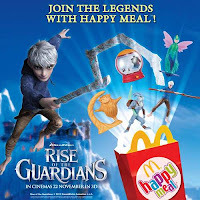 Check out Rise of The Guardians Happy Meal toys in high resolution pictures here!